Injuries, overtimes, near-goalie fights and sudden death wins. The Eastern and Western 2014 conference finals had more action that an episode of Game of Thrones. Okay maybe that’s a slight exageration… but not by much. Allow me to recap the best and worst of it. This series had some of the best hockey this entire NHL season has seen. Goals, hits, near goalie fights. And of course, a come-from-behind Game 7 win by the underdog team. It was incredible. Both teams are so filled with talent that it was even fun to watch their fourth lines battle it out. 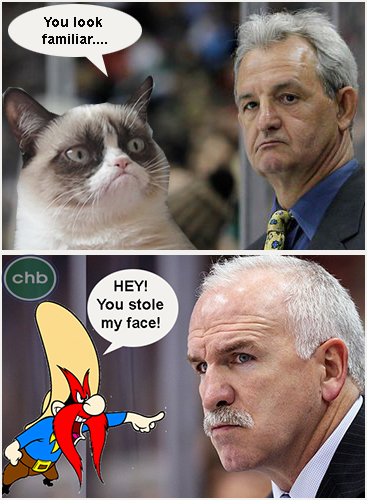 Plus, on the bench it was like watching Grumpy Cat coach against Yosemite Sam. Pure awesomesauce. After such a big, emotional win against the Boston Bruins and an emotionally-disturbed Milan Lucic, this series was bound to feel a little less exciting. But it wasn’t just the energy that lacked, it was the Habs offense. As the games went on, the whole Montreal team began to resemble a deflating balloon. They were done. They weren’t coming back. Add to that two kind of chirpy, whiney head coaches and you’ve got a frustrating series. 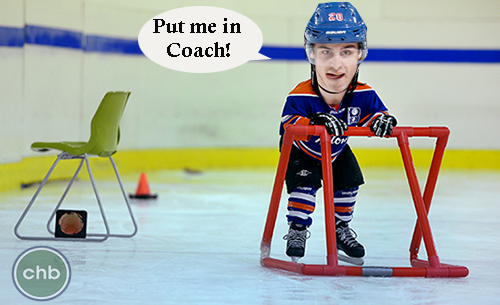 Chris “Ice is slippery” Kreider. Jonathan Quick, watch yourself. This professional hockey player can’t seem to stay on his skates near goalies. Rangers fans will tell you he was pushed into Marc-Andre Fleury and Carey Price. Hockey fans know there’s a way to avoid contact and a way not to. If your legs are caught up in a stick, you fall face first, not skates-first, like he did when he ended Carey Price’s playoffs. This guy is making this a habit and it’s not cool. In the end, losing Price wasn’t what caused the Habs to lose the series, but if it happens against the Kings too, this guy better get a suspension. This kid could have ended up curled up in the back of his net, sucking his thumb and crying for his mother and no one would have blamed him. He’s the back-up’s back-up, fresh from the farm team, and was thrown into the starting goaltender’s role in the Eastern Conference Finals for a team with the most rabid fan base on the planet. But Tokarski rose to the challenge, and in the end, you really couldn’t blame the Habs losses on the goaltending. He was a hero even if his team didn’t advance. Look very, very closely…. Put on your glasses. Pull out a magnifying glass. Blow the picture up as big as possible. No that’s not a caterpillar on his lip, or Cheetos dust on his chin. 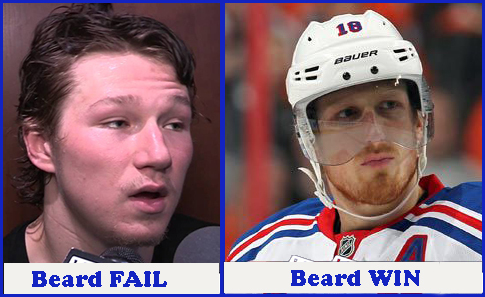 That’s a beard. I know the kid is like 19 or something so I should cut him a little slack but his attempt at facial makes Sidney Crosby look like a rugged mountain man.